The time was March, 1973, the place a Senate committee hearing where Robert Byrd was interrogating L. Patrick Gray, the head of the FBI. 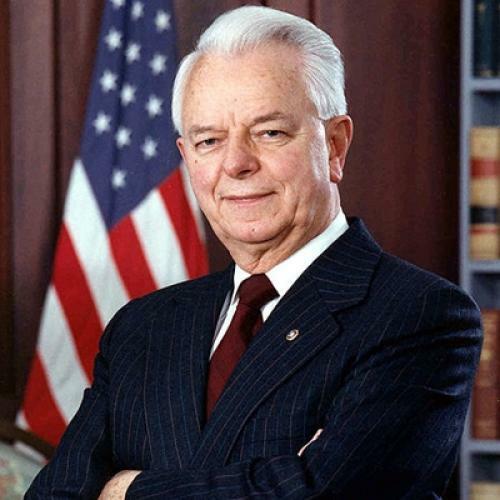 A series of probing questions from Byrd elicited an admission by Gray that he was taking orders from the Nixon White House in his conduct of the investigation into the attempted burglary of the Democratic headquarters at the Watergate. When John Dean, Nixon’s White House counsel, heard about Gray’s testimony, he realized the jig was up and that he had to confess his involvement to the United States attorney. Dean’s testimony would reveal the true dimensions of the scandal for the first time. This is when I first understood that Byrd deserved to be taken seriously. We had started out as political opponents in the 1960 West Virginia primary. I supported John Kennedy; Byrd, Hubert Humphrey—not because he favored the liberal Humphrey but because he was serving the interests of Lyndon Johnson, who wanted to use Humphrey to stop Kennedy and pave the way for his own nomination at the Democratic convention. I respected Byrd for his political skills, but for little else. He appeared to be a racist, and I was appalled to learn from his top Senate aide that Byrd required him to mow his lawn on Saturday afternoons. But beginning that day in March of 1973, I saw Byrd grow into a great senator, culminating in a recent statement that I had yearned throughout my life to hear from a senator or governor from my home state. He declared that West Virginia must no longer allow its politics to be dominated by a coal industry that endangered both the environment and the safety of its workers. I have to concede that Byrd may have found the courage to take this stand only when he realized that death was near and that he would not be running for office again. There can be no doubt, however, about the courage he displayed in his great speech against George W. Bush’s rush to war in Iraq in 2003. Most of his fellow Democrats were afraid to join him that day; all but two had opposed the first Gulf war and feared that, in the eyes of the voters, history had proved them wrong. They did not want to risk a similar verdict this time. But Byrd took the risk. Moreover, his stand showed bravery in another way. West Virginians have a history of military service, with one of the highest, if not the highest percentage of its population to have made the ultimate sacrifice in their country’s wars. And like many other members of his generation who had not served in World War II Byrd was especially sensitive to this issue. He knew that by opposing the war he opened himself to accusations of cowardice and failure to support our troops. To Byrd, this had to mean that he might not be re-elected. Why would a man who always won by landslides have such a fear? Here’s a story that explains the depths of his electoral anxiety. Charles Peters, founding editor of The Washington Monthly, and a native of West Virginia, is the author of Lyndon B. Johnson published by Times Books earlier this month.